Day 1. Nairobi - Masai Mara. Maasai Mara, Kenya's most popular game sanctuary where you will have the best opportunity of spotting the Big Five - lion, leopard, buffalo, rhino and elephant. Depart Nairobi in the morning and drive through Kikuyu farmlands to the edge of the Great Rift Valley. Stop briefly to view the Great Rift Valley at the view point. Lunch at Narok where you have a walk around the Maasai Town. Arrive the famous Maasai Mara game reserve, the jewel of Kenya's wildlife and the greatest spot for wildebeest migration late afternoon. Dinner and overnight at Campsite. After breakfast proceed for a full day of game viewing at the Masai Mara reserve is Kenya's most popular game park in Kenya. Masai mara hosts an amazing concentration of wildlife. You are guaranteed to see the Big 5. Lions abound throughout the park as do leopards, cheetah, hyenas, giraffe, impala, wildebeest, topi, baboons, warthogs, buffalo, zebra, elephants, and of course hippos and crocodiles in the Mara River. e. Picnic lunch at the Hippo Pool. Dinner and overnight at the Campsite. Another full day is spent in the Maasai Mara which is Kenya's most celebrated game reserve, it offers the possibility of seeing "the big five" and many other species of game. 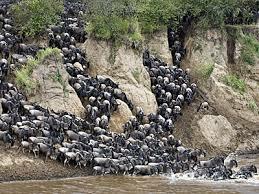 This is where the great wildebeest migration is a spectacle to behold for any would be visitor to Kenya mainly in July to October of each year.. This day you have an option of going to visit the masai village to learn more about their culture. All meals and overnight at campsite. The annual period of birthing provides a feast for predators. Driving across the plains, one can count literally hundreds of hyenas and dozens of lions scattered about. It may seem that the wildebeest are doing the predators a favor by dropping their young all a the same time, but in fact a surfeit of wildebeest veal in a very short period results in the predators’ becoming satiated and unable to consume as much as they would if the calving happened over a longer time span. The predators thus have only a limited impact on the population of newborn calves; any calves born outside the peak are far more likely to perish. Towards the end of the short dry season, around March, the short-grass plains of the southernmost Serengeti begin to dry out and the wildebeest begin (or continue) their journey, heading towards the western woodlands. How do they know which way to go? There are at least two possible answers, according to behaviorist and ecologist Harvey Croze, co-author of The Great Migration. The wildebeests journey is dictated primarily by their response to the weather; they follow the rains and the growth of new grass. And, although there is no scientific proof that this is true, it seems that they, and other animals, react to lightening and thunderstorms in the distance. ‘It would be surprising if even the wildebeest could overlook such prominent portents of change,’ writes Croze. From the western Serengeti the herds head north, following the rains (or their effects) into Kenya and the Maasai Mara Game Reserve. On their trek the wildebeests’ path is cut several times by rivers: in the Serengeti by the Mbalageti and the Grumeti, and in Kenya by the Mara. For most of the year these rivers are relatively placid, but they can become violent torrents in response to rainfall in their catchments areas, and then they present major obstacles to the progress of the wildebeest. Pre-morning game drive in Maasai Mara, Kenya's most popular game sanctuary where you will have the best opportunity of spotting the Big Five - lion, leopard, buffalo, rhino and elephant., after breakfast depart to Nairobi with game drive enroute and picnic lunch arriving at around 5pm.